Video: Watch the instructional video about Mosaic Editor: here. Important: For more information about the Mosaic Editor workflow: Mosaic Editor Workflow. 1. On the Menu bar, click View > Mosaic Editor. 2. On the Menu bar, click Mosaic Editor > Mosaic Editing. 3. On the sidebar, in the section Regions, click Draw. 3. On the Mosaic View, left click to insert the vertices of the region, right click to draw the last vertex and close the polygon. 4. (optional) Edit the shape of the region: left click over a vertex while dragging it to the new position. 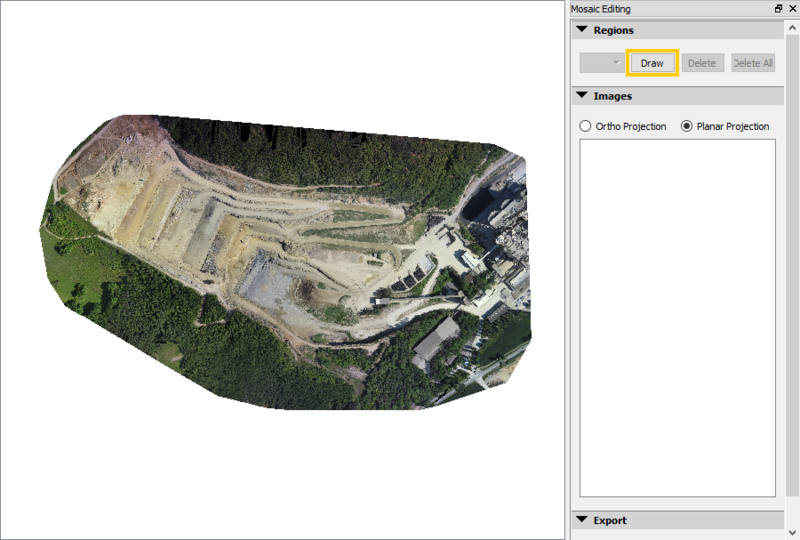 5.1 On the sidebar, in the section Images, select Ortho Projection or Planar projection. Ortho projection: The Ortho projection preserves distances and can be used for mosaics dedicated to measurement applications. Planar projection: The planar projection does not preserve distances, but has less distortions than the Ortho projection on sharp transitions such as building edges. Therefore it is not recommended to use planar images for mosaics dedicated to measurement applications. Its basic use is to improve the visual aspect of the Orthomosaic. 5.2. 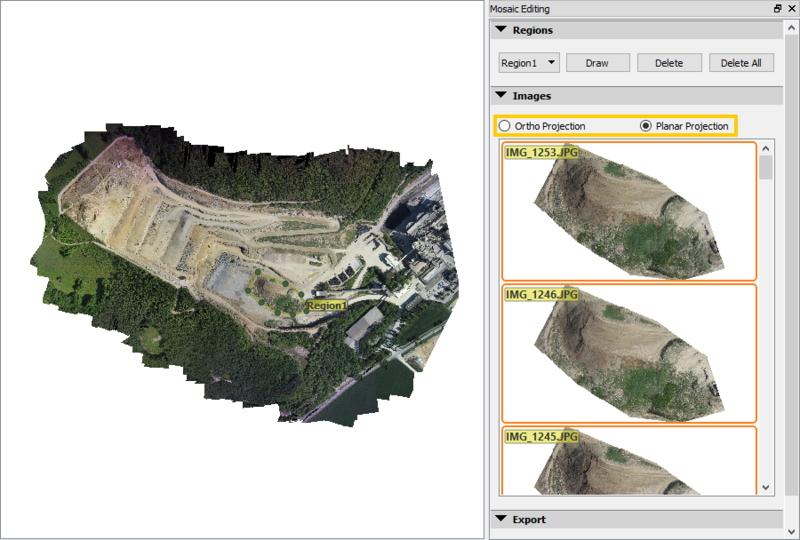 Select an image in Planar Projection or select one or multiple images in Ortho Projection. If multiple images are selected, they will be blended together. Reset the displayed Mosaic. The last saved and exported Edited Mosaic will be displayed. Note: To refresh the displayed Mosaic it is needed to aggressively zoom in/out or close and open the project again. Reset the displayed Mosaic by using the DSM and Orthomosaic outputs files: On the sidebar, in the section Export, click Reset. Note: The Reset option does not reset the drawn regions. 1. On the sidebar, in the section Export, click Save. Note: After saving the drawn regions can be deleted without affecting the saved edits. The edits will be lost only if the project is closed. 1. On the sidebar, in the section Export, click Export. Exporting the Edited Mosaic will overwrite all the mosaics generated at step 3. Is it possible to snap to existing region vertices when creating regions? The vertices of existing regions highlight with a yellow circle when hovering above them, but although I might click at that yellow point, zooming in to inspect - the new vertex does not snap to the highlighted vertex. Is there a way to snap to it? Unfortunately, it is not possible to snap the vertices in the Mosaic Editor. However, I'll share your suggestion with our team to consider adding this feature in the future. My Ortho image has this strange color for one of the tiles. Can I redo just a few images that make up a single tile? See screenshot. I am afraid that It is not possible to process just a few images, Step3 has to be run again. 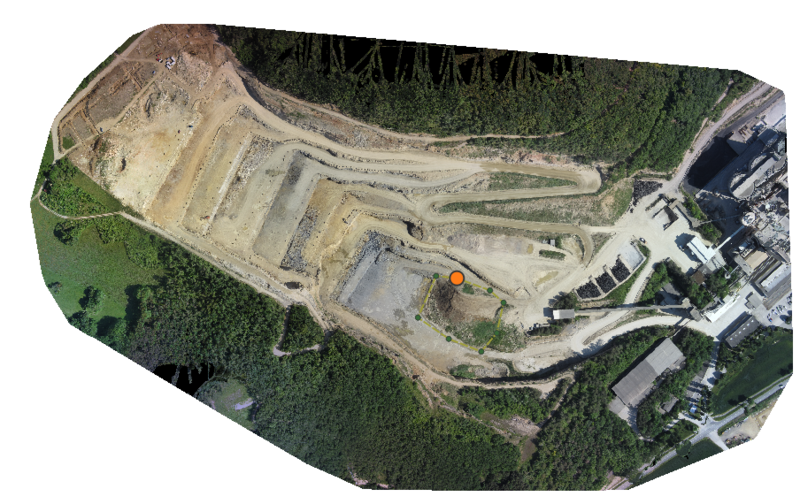 You could use a processing area and process a part of the project only but the previous ortho would be overwritten. I wonder why that is happening, how do the original images look like? If you go to Contact Support and open a ticket, we could try to find the reason for the failure.